Suitable for ‘doggy day care’, dog boarding, catteries, pet sitters, groomers, trainers and dog walkers. Provide your clients with the best customer experience available on the market. A booking system that is personal and exclusive. 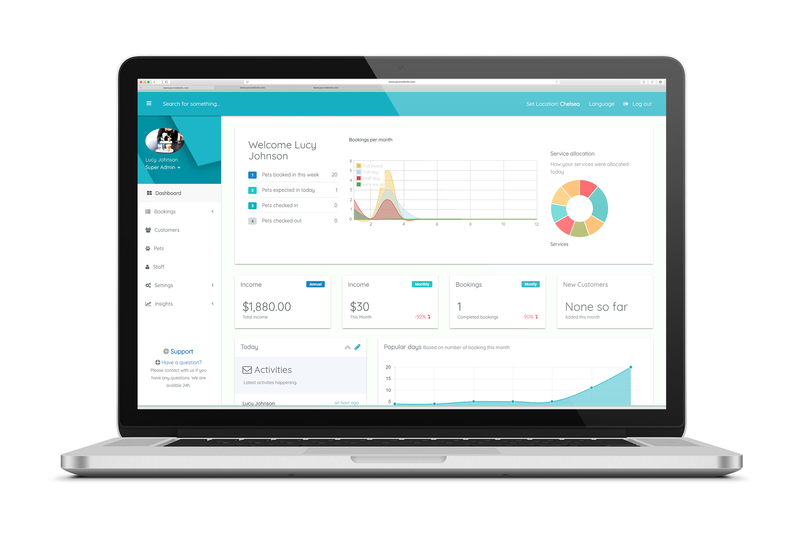 Track your business growth and clients’ behaviour with stats and insights. See your busiest periods and allocate your resources accordingly. 90% of our clients save over 15 hours per week on their admin tasks. Be more efficient and free up your time to focus on the things you love. We adapt to you with our fully customisable system that meets your needs. Run your business the way you want to. Statistics. Track your business growth and compare weekly and monthly revenue reports. Monitor your most popular services, most loyal customers, and busiest times. Get to know your clients and their spending habits. Customer Relations Management. Each customer and their pet have their own profile with emergency contact details, vaccination information and additional requirements. You can attach files to each profile and store all the documents in one place. Staff Management. Using simple drag and drop, you can assign pets to staff members so they know who they are looking after or picking up. Staff access allows them to see their schedule and check pets in/out but they don’t have access to your dashboard and confidential information. Payments and Accounts. You can accept online payments through an integrated Stripe account or send invoices on a regular basis. Choose the best option for your business. Discounts. You can set up any type of discount based on the amount of pets, combined services, or number of bookings. The system automatically calculates the total price for you. Multiple booking types. Daily or overnight stays and regular appointments. Suitable for ‘doggy day care’, dog boarding, catteries, pet sitters, groomers, trainers and dog walkers. One click to check-in and check -out . 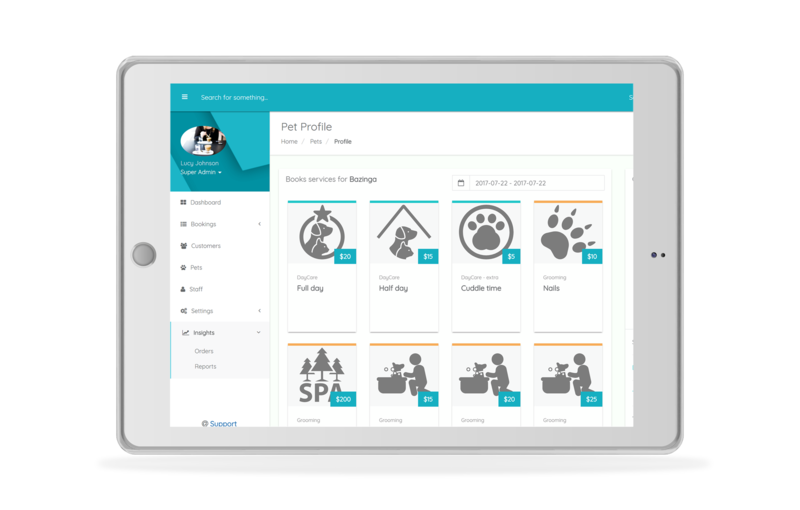 Keep track of who’s in and keep record of how much time each pet has spent with you. In a few seconds, you can check-in and check-out pets as they come and go. Overview. 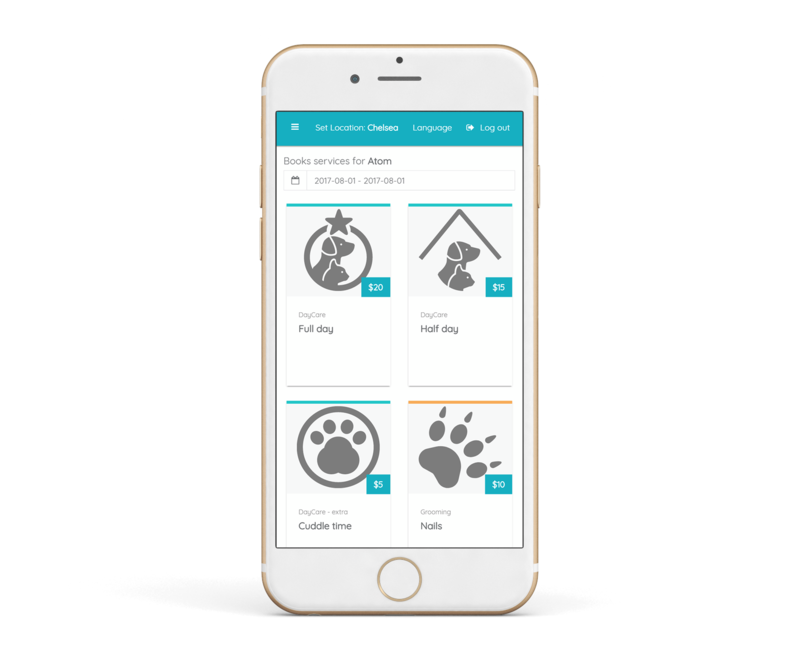 Access a calendar and daily overview to monitor all pets coming in on the day, of the type of services they will use and who is assigned to attend to them. Unique services. Customise your products and create services that your business offers with only a few clicks. If you offer anything else outside of day care, boarding, grooming, or training, you can easily add any alternative services like hydrotherapy, massages, one-on-one training, consultations etc. Reminders. Your customers will receive booking reminders, appointments confirmations, vaccination alerts, and anything else you want them to keep on track. You can customise emails with your corporate branding, set it up once and let the system do the hard work. Full control. You set the maximum number of spaces that you can cater for at once, so there is no risk of overbooking. 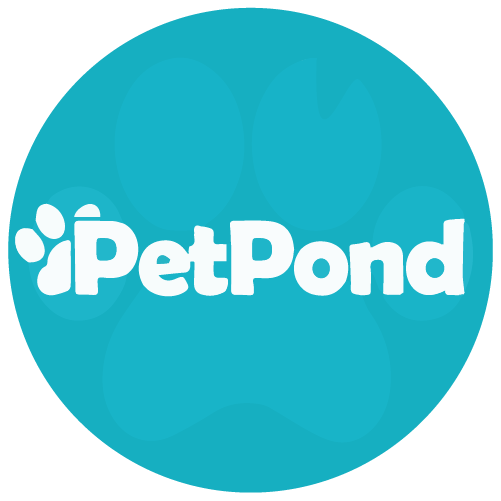 Pet Parent and Pet have their own portals with photos, contact details, emergency phone numbers and access to a booking calendar. Booking calendar. Pet Parent can book online 24/7 and check all booking history. Simple to use in just 3 steps: 1) select date; 2) select service; 3) add booking to the calendar. Vital information. Pet Parent can easily update any additional information that you need to know to take good care of the pet. Vaccination up to date. Vaccination documents are attached to each pet profile and the parent will receive an alert when a document is about to expire. Online payments and invoicing. Pet Parents can complete transactions online and also check invoices and billing history. Increase engagement. It’s a highly addictive system. Pet Parents become exclusive members of your pack. It’s proven that they will talk about the unique customer experience you provide and the bond you have. Go ahead, take a look around and play with the system. Get in touch and we will set you up for FREE in no time. NO commitment. NO contract. NO credit card required. Looks and works great on any device. You can work on your phone, tablet, or laptop. Accessible 24/7 from anywhere, nothing to download or install, all you need is internet access. No more worries about patches and updates. We integrate with your website by using your branding, logo, and domain name. Once registered, you will be up and running in no time. In a few simple steps, you can update your settings and modify services.